We are proud to recommend these companies to help you create your beautiful home, rent or sell your home, or manage your property. One stop shop for easy landlord forms - create state specific leases, rental forms galore, answer questions and more! Can't make a trip to find your home before your move? 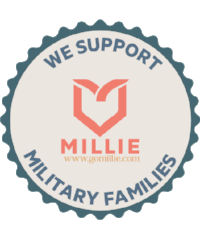 Millie's AgentHeroes are an elite group of hand-picked real estate agents that are either veterans or military spouses. They have PCS'ed before and understand the process. . They possess a rare combination of skillsets, experiences, and proven dedication to service that comes from their time in the military. All have five years or more years of experience in real estate, and do — on average — over 20 transactions per year. Make your next move easier with Millie. A life saver! I use amazon for so many of my person needs, but it is a true gem when it comes to managing rentals. I can easily ship things out to my clients in a matter of a few clicks so they can go about their day knowing their needed item is on the way to them. I also use it as a great resource in decorating - staging, renovation supplies, and more. There are endless reasons I love Amazon and hope you'll find life is easier with them too! Oh my oh my! I can spend hours on Joss and Main just looking at their lovely home decor. I often order pieces for my own home and for staging our rentals. They offer great quality, fair pricing, and often free shipping. Even more, their customer service is top notch and they keep me coming back.